The 2.6 kernel doesn't have vsync required for full project butter experience. The 3.0 kernel version has this though. Camera is not working on the 3.0 kernel version. The fix for HSDPA causes an issue with APN's in Jelly Bean if you use SIM pin lock. To workaround that turn on and off airplane mode after entering pin code. Warning: Only use this recovery to flash CM10. Otherwise, you risk bricking your phone! Flash gapps*.zip. You must flash gapps after every upgrade to CM10 since /system is formatted, wiping your previous add-ons. Upgrades from previous versions of CM10 are the same process as install, except you do not need to wipe anything. Contrary to popular belief, you do not need to even wipe cache and dalvik-cache when upgrading between CM10 versions. You only need to wipe if you are doing a major upgrade, switching to a different ROM entirely, or attempting to fix bugs caused by bad backups or corrupt app data. Hi. Can't download. Can you upload this file to mediafire? I'll wait for next versions. 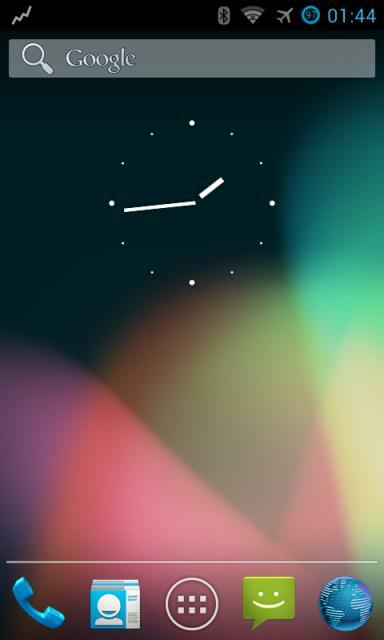 My CM9 beta1 is rocking. But thank you for all the work. drain lots of battery. 6 hrs only. Wow many bad comment?I think i should download? I installed it yesterday but I have some serious problems with wireless and sound. Just like CM9, i bet this will be a blast as well!!! Keep up the good work! Just installed the CM10 on to my Galaxy W. Its pretty decent being Alpha 1 version. The important function of all, the PHONE is working. Good Job. Well if you guys still love to hear your radio fm built on and video call using skype, or any video call app , than stay on stock rom the savest and stable rom on earth is ginggerbread. , just modif the looks with themes or launcher, above all arco and cyanogen are brilliant that's i my self give him my deepest honour, for what he have done to our beloved Wonder ancora the wonderer wariorr lonesome galaxy hik hik hik. Works great on my device! Runs way better than cm9. 2. Copy vold.fstab file (swapped) to sd card. 3. Open root explorer and copy vold.fstab file in your sd card. 4. Go to /system/etc directory and click at Mount R/W button at top right of the screen. 5. Click Paste and replace the original vold.fstab with the swapped vold.fstab. Do anyone know a kernel with overclock for 1,8 Ghz for galaxy w how i had it for cm9? 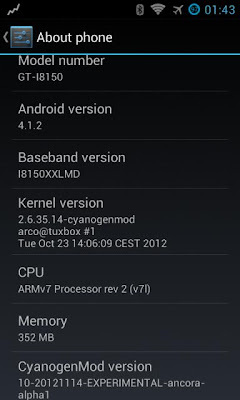 This kernel is for CM9 only. 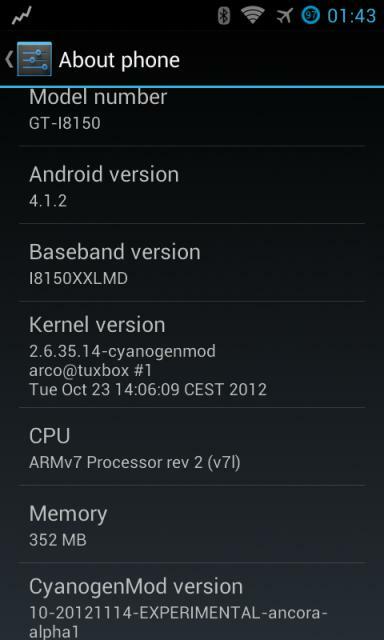 Might brick your phone if you use this kernel with CM10. Before installing this ROM, do I need to root my phone 1st? If needed, after rooting it, what should I do? may I ask? does google now works in this rom? excuse me, I've upgrade my galaxy wonder to CM 9, but video call on my phone is not working. Why? And if after I upgraded to CM10 the video call is work again?? do i have to install all of it or just the latest one? which is the CM10 alpha3? I've tried both the 2,6 kernel and the 3, but both of them messses up my APN's. Can't see any and can't add new ones. Reverting back to alpha 2 fixed it though. 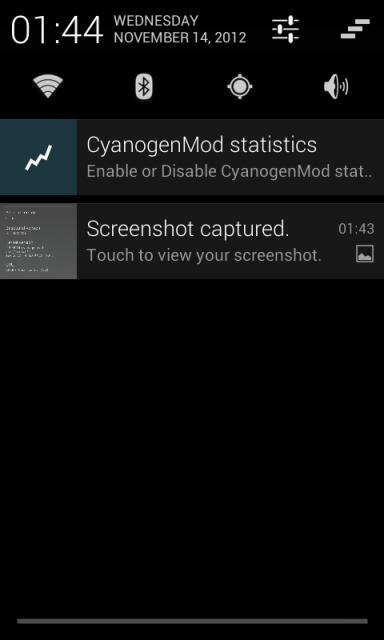 do you know how to remove cyanogenmod on galaxy wonder? Clear cache, factory reset. Do all this in CWM. Then restore the backup of the previous rom(which should be the stock rom). how to remove cyanogenmod on galaxy wonder? please give me the process. Camera and torch not working. For an alpha, it's already very good. Thank you for tip on the memory swap, it works perfectly. i install alpha 3 to my phone but i can't connect to the internet by Wifi, anybody can help me please ?? is this an alpha? I flashed alpha3 with kernel 3.0, works great, only exception being camera. fix that, and skip beta entirely: its a stable version. I don't think you can use the SD card for the memories. I mean for system memory.But you can swap external and internal memories-how to above. what do you mean convert to system memory. you mean swap? Still need a little bit of work... I installed kernel 3.0 but did not tried the 2.9. It does not let me create a new APN even after using the workaround and the camera did not worked. I returned to an stock rom while searching for another Mod. Thanks for the work anyways! what is the forecast release of alpha 4? Hey really, really nice work !! No pressure at all -but can you estimate a date, a new update will be released? I love this mod so far, but no working camera and the extreme battery drainage are hard to deal with. As i said, no pressure - but if you say you'll need another month or more, i would cover the time till then with another mod - maybe cm 9. Can you overclock the processor with this custom ROM? Yes you can. there are some kernels that allows our phones to reach breakneck speed of 2092MHz or for the safer 1804MHz which includes some new CPU governors. do you have permissions to share forfivo's kernel with your mirror link???? Thanks. I'm kind of a noob but how do I add the kernel to my phone? will you update your blog as like as the the ORIGINAL THREAD from arco68? you can put the link please? agree. Arco have done exceptional job with this rom and still continuously developing to make it perfect. all credit goes to him. The camera works in 3.0 kernel version. please help me, my galaxy w was succes instal cm 10, but sd card internal & eksternal not detect? do a full wipe before installing the rom para wala problema ma encounter. (Wipe system, data, cache, dalvik) Kung sinisipag ka, pull out battery --> full wipe --> pullout battery again --> full wipe again --> reboot recovery --> install rom --> install gapps --> restart --> setup phone --> restart again. in my experience, it's always good to restart phone at least 2 times pag bagong install ang rom. what are the differences between kernal 3 and kernal 2.6? i've tried kernel 3 alpha 4.. but now considering to try kernal 2.6 alpha 4.1... do i have to wipe data and cache and flash update.. or just flash update without data and cache wipe? Hi... Video call work in kernel 2.6??? Does the camera work in the 2.6 kernel? ummm... please can u tell me what to do to setup it... ? 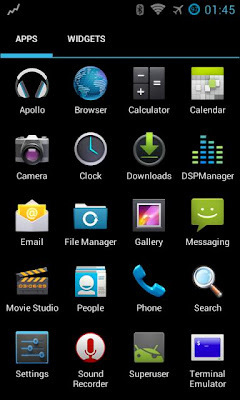 Hi dear I installed cm-10 alpha 3 on my galaxy w but i can't find any app. Fm radio. Why ? It sais "download permissions denied" on both download servers (mediafire and rapidshare). In the description it says that the camera does not work in the 3.0 kernel. But if I install an app from the store to take pictures, does it work? is this rom already stable.? There:s a major bug in alpha 5. When you take a photo, a massive file, 1.2GB in size is crested in storage/sdcard0/DCM or /LOST.DIR depending on the camera app. who shuld i do now? Alpha 5 works fine for my W. The only thing is not working are the ringtones. the phone is always silent. I hadn't noticed any problems with ringtones. Hi Jan Liska, GPS, google maps work fine in Alpha 6? to: Erwin M. F. da Mata - no problems with GPS or Google maps. Thus ROM is for the Galaxy W, i8150. Alpha 7 does not support memory swapping can anybody confirm this? there isn't buil-in swappping memory, but you can do it your self :). Search http://forum.xda-developers.com/. 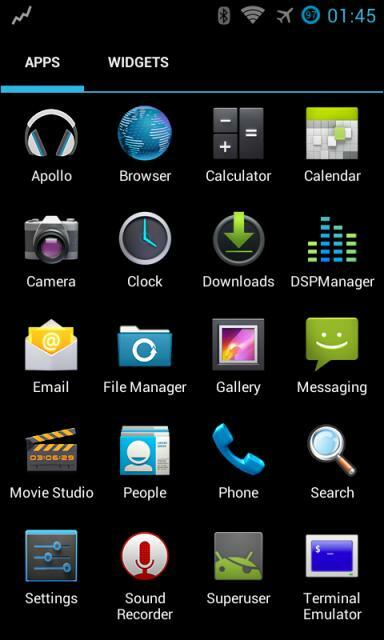 Cyanogenmod 10.1 - Jelly Bean 4.2.2 released. Go to: http://forum.xda-developers.com/showthread.php?t=2214042. It's still alpha 1, but for me is it good enough for daily use. What I mean is, I flashed Alpha 7 onto my phone and then copied the modified vold.fstabn file onto system/etc but the memory swapping does not seem to work. It worked perfectly on both Alpha 6 and Alpha 5. I can only advise you to search XDA forum or ask a question on CyanogenMod 10 - Discussion thread (http://forum.xda-developers.com/showthread.php?t=1913733) where the problem. OK the memory swap mod works great now. Damn typo, well lesson learned. why i can't open my message? plzz fix the bug of battery..my battery so fast finish..
why my SD card cannot read? .. Please help..urgent.. Which is the best version or alpha of this rom ?and does it matters if my kernel version is 2.6. and I install kernel 3.0 ? thanks for posting. but pls help me how to uninstall cyagenmod on gt-i8150? because i want back to original android version 2.3.6. so what shall i do? thanks!